This is our cardamom Co2 select extract. It is beyond fantastic. So now you are saying great, so I have Cardamom essential oil, what is the difference between that and the CO2? 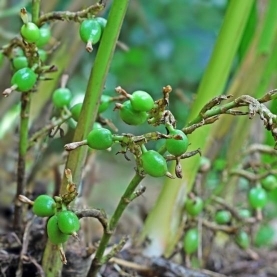 The main difference between Cardamom essential oil and the CO2 extract is the process of extraction. The essential oil is steam or hydro distilled, while the CO2 extract is extracted by using carbon dioxide gas and a low pressure. They also vary a bit chemically, not too much though. However the aroma of the Co2 select is fuller and deeper and rounder. Cardamom CO2 extract is much “fuller” in aroma. This select extract truly has the aroma of freshly dried Cardamom pods, and it’s a much deeper aroma than Cardamom essential oil. We have found that this extract is highly anti spasmodic and great for the digestive system, and respiratory system. This is in part due to the high percentage of of esters. It is also quite warming and acts as a rubefacient. This means it’s wonderful in blends to increase circulation and bring heat to an area. It is also a mental stimulant and can be used to clear the mind and increase focus. It is a great extract for anything digestive and stomatchic. It has also been know to use it as a pulmonary stimulant. Energetically and emotionally, Cardamom Co2 extract is stabilizing for the emotional and mental bodies. Because it is extracted from a seed, it offers a level of nurturing and protection when used in blends. It has also been known to be a wonderful aphrodisiac. Cardamom adds sweetness and hope to depressive situation. There is a completeness and gentleness that is within this extract. Because this extract offers you the “whole seed,” if you want to add this kind of “wholeness” to any blend, try using Cardamom CO2 extract. It helps people that are burdened with worries and and events that test our ability to endure. Accoring to Madelien Hayes, cardamom can help people that are "cold to the core3"
This is a Co2 select extract. So what does that mean? Let's jump down that rabbit hole together. A Co2 extract has been extracted using Carbon Dioxide Gas. It is an ultra cool process. So, once again this is a Select. The select extracts are close to essential oils and you would use them pretty much in the same way. The select is extracted at a low pressure. Chemically this Cardamom extract has a good amount of 1,8 cineole and and also terpynal acetate. The cineole is an oxide, which makes this extract great for the respiratory system and also great for the mind. The acetate is an ester and that makes the extract a great anti spasmodic.